The previous post was 4-Node ONTAP Select cluster on KVM. 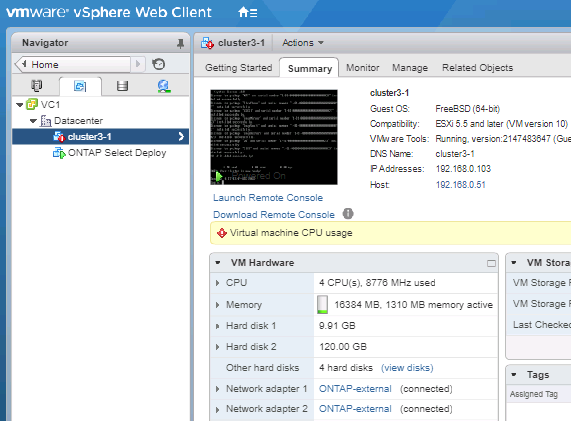 Here we do a single-node cluster on VMware. The ONTAP Deploy CLI commands are pretty much the same, just one node/host rather than 4. 3) Configure the ESX host that was just added, and after ~2 minutes verify the host has a status of “configured”. 4) Create the cluster. The cluster create command takes approximately 60 seconds to complete. The cluster creation process takes approximately 30 minutes. You can see the cluster powered up in the vSphere Web Client.